Scotland has lived up to everything everyone has told me. The scenery is amazingly beautiful, but it rains frequently. The water is quite cold, but the wind provides fantastic sailing. 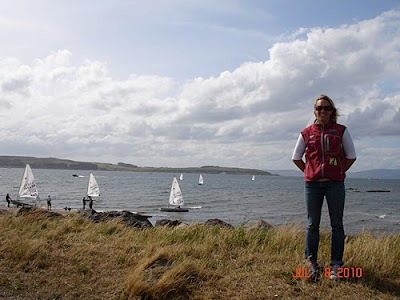 I have been here in Largs for the last week and a half, training to get ready for the 2010 Laser Radial World Championships. After Kiel, I flew to England to visit my relatives for a couple of days before I got my boat up in Scotland. I arrived in Scotland on 27th June and got settled in on my uncle’s boat just up the coast. Halfway through training, I moved to a Bed and Breakfast in the town of Largs. 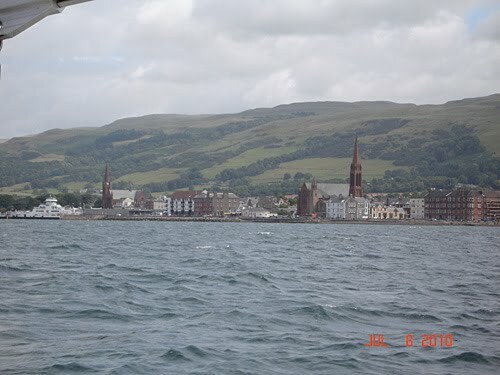 Largs is a small seaside town with a small population. I think our regatta has almost doubled the size of the town, but everyone here is very friendly and welcoming. In the evenings, there isn’t a lot to do, but there is a bowling alley that has been showing the world cup soccer games; so between bowling and soccer, we have been thoroughly entertained. Even though I don’t have my team with me, I have been keeping up the ice cream superstition at the local ice cream parlor. 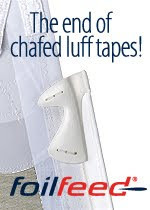 I have had my boat since the 28th and have been sailing hard since. Unfortunately, the first day of sailing, there was no wind so we drifted out to the race area and drifted back to the shore. It was nice to get back in the Laser Radial and get a feel for things before the breeze came the next day. The next day, Team USA got together and did some training over the following couple of days. We had winds anywhere from 12 knots up to 25+kts, and as a team, we all improved our speed and fitness in preparation for the regatta. Along with our USSTAG team coach Dennis Paaske, Brad Funk, my husband, was here coaching me and getting me back up to speed as much as he could. Brad worked hard with the whole team on the big breeze set ups and technique. It was also great to see him for a week before we went our separate ways for a couple of weeks. He is currently in Turkey coaching the ISAF Youth World Championships. It has been good getting to know Dennis and work with him a bit before the regatta starts. He has a lot of knowledge on race course tactics and I’m really looking forward to learning from him while I’m here. Training ended today with a short session to break in my new sail and practice some last minute skills. The regatta starts tomorrow, and you can follow on the regatta website.